Earth is getting hotter, and pretty quickly too. The 1990s were the warmest decade in a thousand years. Global temperature keep increasing, creating conditions that intensify wildfire danger, by warming and drying out vegetation and by stirring the winds that spread fires. Fast fires are hard to contain and likely to expand into residential areas. Already about 1 billion people live in areas prone to natural disasters. The United States suffer from one of the highest fire death rates in the industrialized world, with more than 2 million fires reported each year. More than 4,000 Americans lose their lives and another 26,500 are injured annually as the result of fire. Fire Departments around the world call on “waterbombers” to fight the fires. Carrying huge amounts of water and retardents, they actually are more cost-efficient than most other fire fighting methods. One of these waterbombers is the Erickson Helitanker. It can deliver 7,500 litres (2,000 gallon) of water in one drop, and refill from any water source 45 cm (18 inches) deep in about 45 seconds. The Helitanker can precision deliver 110,000 litres (30,000 gallons) per hour. Other aircraft are used too, such as the C-130, Martin Mars and DC-6. 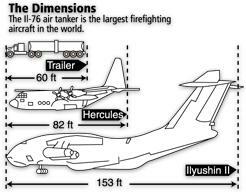 But the largest and fastest of the waterbombers is the turbofan jet Ilyushin-76TD (Il-76). It can reach a fire anywhere in the world within 12 hours. Carrying 42,000 litres (11,000 gallons) of water and fire retardants – 4 times as much as a C-130 – it can, in one run, dump enough water to cover 6 double-wide football fields, or an area 1,1km (0,7 miles) in length. The Helitanker can refill from any water source 45 cm (18 inches) deep.